Congratulations to Tricia Hirst riding Vlacq Abattarik, who won the FEI 160km in an exciting racing finish with H.H.Sh.Nasser Bin Hamad Al Khalifa, and H.H.Sh.Khalid Bin Hamad Al Khalifa, at a speed of 16.96kph. Congratulations too to Jenni Gilbert on Flurrie who won the 160km National class. ENDURANCE RIDER Kirsty Wiscombe from Lyme Regis completed two 160km rides in the last two weeks and finished both. She has four horses registered to compete this season plus her young riders Natasha and Dace Sainsbury, who also live in Lyme, who have three horses. Kirsty's two novice horses, Yawl Hillbilly and Ishtar Spirit, have been going well and have done three rides each. BAHRAIN ROYAL EQUESTRIAN AND ENDURANCE FEDERATION (BREEF) PRESIDENT SHAIKH NASSER BIN HAMAD AL KHALIFA HAS BECOME A NOMINEE FOR THE NEXT ENDURANCE WORLD CHAMPIONSHIP FOR THE FEI AFTER HIS BIG WIN YESTERDAY IN THE 160KM BAHRAIN DUKERIES RACE. SHAIKH NASSER CAME THIRD IN MAY'S RANKING. HE CAME SECOND IN THE BRITISH DUKERIES RIDE FOR THE SECOND CONSECUTIVE YEAR. SHAIKH NASSER WAS ALMOST A WINNER AT YESTERDAY'S EVENT BUT WAS HELD BACK WHEN HIS THE HORSESHOE OF HIS HORSE GANDA KOY FELL AT THE FIFTH STAGE. THIS CAUSED HIM A 10 MINUTE DELAY. SHAIKH NASSER, THE ROYAL TEAM CAPTAIN, EXPRESSED DELIGHT TO STAND ON THE PODIUM FOR THE SECOND CONSECUTIVE YEAR NEXT TO HIS BROTHER SHAIKH KHALID WHO CAME THIRD. THE BIGGEST GAIN FROM THIS RACE IS THAT THE BAHRAINI TEAM, NOMINATED TO PARTICIPATE IN THE 2008 FEI WORLD ENDURANCE CHAMPIONSHIP IN MALAYSIA, HAS COMPLETED ALL STAGES OF THE EVENT SUCCESSFULLY, HE SAID. THIS IS THE FIRST STEP IN PREPARING THE TEAM FOR THE CHAMPIONSHIP, HE NOTED. SHAIKH NASSER DESCRIBED THE RACE AS EXCITING AND SAID THAT EACH HORSERIDER HANDLED THE RESPONSIBILITY EFFICIENTLY. BAHRAINI SUCCESS IN EUROPEAN RACES WILL CONTINUE IN COMING STAGES, HE REMARKED. SHAIKH NASSER AND SHAIKH KHALID SAID THAT THE ACHIEVEMENTS OF BAHRAINI ENDURANCE WERE A RESULT OF THE SUPPORT OF HIS MAJESTY THE KING. HIS MAJESTY'S FOLLOW-UP DURING THE RACE PUSH US TOWARDS PUTTING MORE EFFORT TOWARDS CLINCHING MORE ASSETS FOR BAHRAINI SPORT IN GENERAL, AND ENDURANCE ESPECIALLY, THEY SAID. THEY VOWED TO PUT EVEN MORE EFFORT TOWARDS MORE BAHRAINI SPORTS ACHIEVEMENTS. MEANWHILE, SHAIKH KHALID SAW THAT COMING THIRD IN THE RACE WAS AN ENCOURAGING START FOR HIS PARTICIPATION IN EUROPEAN CHAMPIONSHIPS. ALTHOUGH HE WAS BUSY WITH HIS STUDIES, HE WAS KEEN ON CONTRIBUTING TO ACHIEVEMENTS THAT HONOUR THE NAME OF BAHRAIN AND HAD SUCCEEDED IN THAT UNDER THE LEADERSHIP OF SHAIKH NASSER. SHAIKH KHALID EXPRESSED JOY AT THE RESULTS OF BAHRAINI JOCKEYS IN THE RACE AND AFFIRMED THAT THE COMING RESULTS WOULD BE EVEN BETTER. ROYAL TEAM JOCKEY AHMED ABDULLAH CAME FIRST IN THE 120KM PHASE OF THE BAHRAIN DUCKERIES RACE IN THE UK. THE GUIDANCE OF SHAIKH NASSER AND SHAIKH KHALID AND THE COOPERATION OF THE TEAM WERE BEHIND THE ACHIEVEMENT, HE SAID. THE RACE WAS GOOD AND EXCITING IN ALL ITS STAGES AND WAS A GOOD BEGINNING FOR THE FIRST RACE OF THE ROYAL TEAM IN BRITAIN, HE SAID. COMMENTING ON THE RESULTS OF THE TEAM IN ITS FIRST RACE IN THE UK, THE COACH AND JOCKEY AT THE TEAM SHAIKH DUAIJ BIN SALMAN AL KHALIFA THAT THEY CAME AS A GOOD PREPARATION FOR THE CHAMPIONSHIP IN MALAYSIA. Winner of the Bahrain Dukeries Endurance Ride FEI 160-km in an exciting racing finish with H.H.Sh.Nasser Bin Hamad Al Khalifa, and H.H.Sh.Khalid Bin Hamad Al Khalifa, was Tricia Hirst, riding Vlacq Abattarik, at a speed of 16.96kph. Jenni Gilbert on Flurrie won the 160km National class. The ride took place at the Dukeries at Thoresby Park, through the undulating forest tracks of Sherwood Forest. With thanks to the main sponsors, the Bahrain Royal Stables, the event was a wonderful showcase for Endurancegb, in front of the beautiful Thoresby House. Results are on the Dukeries website and photos are by David Saunders. Endurance horse Hero, who helped Britain win a gold medal at the 1990 World Equestrian Games, died on 2 May, aged 30, at his retirement home in Ash, Kent. He had been looked after for the past 10 years by Kay and Alan Anstey. Joy Barling Loyla partnered the 15.1hh palomino in most of his career successes. The pair picked up a gold award at the 25th anniversary Golden Horseshoe Ride at Exford and represented England three times in the Home International, as well as winning numerous other rides including the Red Dragon and Breamore. SHAIKH Khalid bin Hamad Al Khalifa's horse Kheopsy Du Pilat was awarded 'Best Condition' trophy after Bahrain Dukeries Ride held at Thoresby Park near Nottingham, in the UK. Having finished third in the main race which was over 160km, the Bahrain Royal Equestrian and Endurance Federation first vice-president made a strong comeback to international competitions and came close towards taking the title. Shaikh Khalid was congratulated on this award by Breef president and captain of the team Shaikh Nasser bin Hamad Al Khalifa who came second overall in this challenging FEI race which was a qualifier for this year's World Championship to be held in Malaysia in November. Shaikh Khalid expressed delight for taking part in this annual championship which was their first of many races as part of their training camp in Europe to prepare for the World Championship. The 160km race, sponsored by the Bahrain Royal Stables, consisted of six stages, starting with 40km for the first stage, 30km for the second and third besides 20km for the fourth, fifth and sixth stages. The event also featured other distances including a 120km race which was won by Bahraini rider Ahmed Abdulla after a fierce battle with top riders from the UAE, UK and Europe. The other Bahrainis who took part in the race were Shaikh Talal, the Bahrain Athletics Association president, Yousif Taher, Jaffer Mirza and Abdulrahman Al Saad who were either eliminated or had to quit during the race stages. 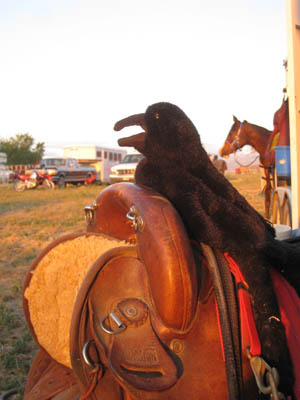 Images and Results for the first day of the 2008 Owyhee Fandango are available! The first day's events included a 50 mile AERC endurance ride as well as a 25 mile AERC Limited Distance ride. Day 2 will feature a 100 mile AERC ride, as well as a 100 mile FEI CEI*** race and also include the Region 4 AHA 100 mile championship event. BAHRAIN's Royal Endurance Team arrived in the UK yesterday prior to their participation in the Endurance Championships for the Kingdom of Bahrain Cup scheduled for Saturday near Nottingham. The team will be led by Bahrain Royal Equestrian and Endurance Federation president Shaikh Nasser bin Hamad Al Khalifa and features the participation of Shaikh Khalid bin Hamad Al Khalifa, captain of Al Khaldiya Stable which is under the umbrella of the Royal Team. This prestigious event, featuring 160km and 120km races, will be the second consecutive appearance for the Bahraini team with Shaikh Nasser coming second overall in last year's championship. Shaikh Nasser said the championships is one of several events in Europe which the team is looking forward to enter as part of their preparations for the upcoming World Cup to be hosted by Malaysia this year in November. "Taking part in these races will give our riders more experience and confidence ahead of the World Cup. The team members have showed performed well during the national championships and now its time to prove themselves on a higher level," said Shaikh Nasser. "We have been keen to allow all team riders to make this trip and take part in such races which will lift their morale as they prepare to compete with top riders from Europe," he said. "Our main aim is to take part in 160km races as many as possible as we are hear up for the Malaysian race. Everyone here is determined to put up a good show in this race and continue our serious training ahead of the World Cup." On his part, team manager Dr Khalid Ahmed Hassan said the team decided to start their preparations early this season for the World Cup. He said the team will be split into two squads with the first taking part in the 160km race while the second will be participating in the 120km event. Dr Khalid has arranged the shipment of the team horses from France. The horses are expected to reach the UK today. Local rider Mette Sutton took all before her when she had the best overall time at the Cooyal ride on Sunday. Sutton and “Tuldar The Magician”, who were in the middleweight division, finished the 80 kilometre course in four hours and 15 minutes on a day when 72.7 per cent of competitors were able to complete the main ride. For Sutton it was her first win on the popular Cooyal course on a day when underfoot conditions were described as excellent. It was also the first time that a local rider is believed to have been the overall ride winner at Cooyal. Angus endurance horse rider John Thomson has successfully completed his 200-mile, east-to-west journey – raising about £2,000 for Ninewells Hospital’s acute stroke unit in Dundee. Mr Thomson and his mount, pure-bred Arabian Prince Omar, arrived at Ardnamurchan lighthouse, the UK mainland’s most westerly point, at midday on Friday. Mr Thomson, 57, of Parklea, Park Road, Brechin, left from Scurdie Ness lighthouse, near Montrose, on Thursday, May 8. He plotted a route which had never before been attempted on horseback. He decided to embark on the journey after suffering a stroke two years ago. He took up horse-riding as part of his rehabilitation at the Dundee unit. He became so enthusiastic about the sport that he trained in endurance riding. He is now a member of the Scottish Endurance Riding Club. Mr Thomson’s intention to complete the journey by Thursday last week foundered when Omar cast a shoe while crossing Rannoch Moor. “It was thanks to Neil Chalmers, the Blairgowrie-based farrier, that we managed to get Omar re-shod,” he said. Mr Thomson’s route, which passed through some of the country’s most spectacular scenery, took him via Killin, Tyndrum and back across the moor to the West Highland Way. One other incident caused a delay, when Omar slipped while crossing a wooden bridge on the West Highland Way. The animal’s injury required attention from a vet at Fort William before he could continue. After spending the night at Kinlochleven, Mr Thomson crossed on to the Ardnamurchan peninsula on Thursday and made his way to the lighthouse via single-track roads. Although Mr Thomson trained and planned over 12 months for the trip, the journey proved to be physically demanding for horse and rider over sometimes challenging terrain. After spending up to eight hours a day in the saddle, Mr Thomson said it is a challenge he does not intend to undertake again soon. Although the exact amount raised for Ninewells has yet to be finalised, Mr Thomson expected the total to be about £2,000. Assisi (Pg) This year’s edition of the Assisi Endurance Lifestyle will run from June 11th to 15th. The rich programme of this unique equestrian event is intended to promote the concepts of environment and our relation to it, as implied by its name. Riders from all over the world will be converging on Assisi to compete in the 160-kilometre long endurance ride around the UNESCO World Natural Heritage Site of Mount Subasio. The hub of the Assisi Endurance Lifestyle 2008 will be the Hospitality Village, covering an area of roughly 30,000 square metres between Assisi and Santa Maria degli Angeli. The Village will host athletes and a number of events. Among the events that have been scheduled for this year’s edition there is an international forum on Tourism and Opportunity, focussing on the business opportunities between Umbria, Dubai and the Gulf States. Shows and entertainment featuring leading performing artists have also been scheduled. Info: 075 5288245, Fax 075 5287189, e-mail info@sistemaeventi.it. Pierazade du Vialaret, the first foal of the cloned stallion Pieraz-Cryozootech-Stallion, has been born in France from the mare Dziupla. 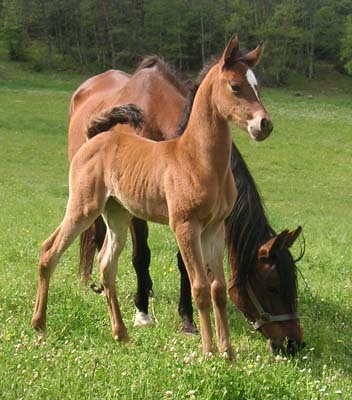 The mare and foal are owned by Audrey Genieys of Le Vialaret in Campagnac, France. "The story begins in April 2007," says Audrey, "when we decided to have a foal of the double world champion. We tried with 3 mares, but only Dziupla worked. Then, it was a normal pregnancy, nothing else to do. The birth was the 5th of May at a quarter past midnight. Everything was OK, the foal was lively and magnificent, filled well." Pieraz-Cryozootech-Stallion was born in 2005 in Italy, and now stands at stud in France. He was cloned from the gray gelding Pieraz, winner of the World Endurance Championship in 1994 at The Hague with Valerie Kanavy, and the World Endurance Championship in Fort Riley in 1996 Valerie's daughter Danielle Kanavy. In total Pieraz won 12 160-km races. Dziupla is a granddaughter of Probat, the leading progenitor of the Comet line in Poland, and major sire of champions in Poland, Scandinavia and the USA. Dziupla has produced Djedda du Vialaret and Devine du Vialaret, both qualified endurance horses on a top 10 at 119 km, and both owned by Audrey Genieys. The FEI has requested commentary from the National Federations with regard to the Proposed Endurance Rule Changes which will be effective January 1, 2009. Lexington, KY - After an extensive search, the USEF has named three-time World Endurance Champion and 1990 AHSA/Hertz Equestrian of the Year, Becky Hart, as Chef d'Equipe for the U.S. Endurance riders. An Endurance veteran, Hart was inducted into the American Endurance Ride Conference Hall of Fame in 1992 and is also a Centered Riding instructor. "It is an exciting time for the US Endurance team," said Hart about her new role. "We are developing new strategies to strengthen our performance and have some very strong horse and rider combinations. Some of our riders have a great deal of experience in international competition. Others, emerging through the ranks, bring enthusiasm and dedication to the team concept." The first task for Hart is to prepare horse/rider combinations for the 2008 World Endurance Championship to be held in Terengganu, Malaysia in November 6 -9, 2008. Hart will serve as Chef d'Equipe through the Alltech FEI World Equestrian Games in 2010. For more information about the sport of Endurance, please contact USEF Director of Endurance, Vonita Bowers at vbowers @ usef.org. Malaysia is set to host the 2008 FEI World Endurance Championship in Terengganu, November 6-9. His Majesty Seri Paduka Baginda Yang Dipertuan Agong Tuanku Mizan (King of Malaysia), an endurance riding enthusiast himself, went to France in 2005 with the Equestrian Association of Malaysia (EAM) to bid for the FEI World Endurance Championship to be held in Malaysia. Despite bidding against other better established endurance nations, Malaysia was conditionally granted the opportunity to host the FEI World Endurance Championship 2008. Following this sanction, two trial events were arranged to evaluate the feasibility of holding the World Championship in a country of a tropical climate for the first time ever. The first trial was held in 2006 for Malaysian horses and the second in 2007 for international horses. The precondition for the trials was a minimum completion rate of 40%. In 2006 and 2007, encouraging completion rates of 56% and 67% were achieved for each respective year. The 2008 World Championship promises to be an exciting and competitive event. Many esteemed international Endurance riders will be competing in the WEC in Terengganu this year along with top Malaysian Riders. Just got back from Mont Le Soie in Belgium having done a 120km race and won it. Taquillero many of you will know was my Aachen horse two years ago has also won the Cirencester 160km FEI race and competed with me now for several years last year had a quiet year after coming 5th at Sangatte and winning best condition then had a leg injury a little later in the year which we gave him plenty of time off for. On appréhendait le temps même si les prévisions météo nous annonçait une alternance de nuages et d'éclaircies. Finalement les cieux se sont montrés cléments et la compétition a pu se dérouler dans des conditions idéales. Brook Sample and Meg Wade are the first riders from Australia to qualify for the 2008 Endurance World Championships to be held in Malaysia in November. The first of three FEI rides schedule for Victoria this year was conducted on the weekend of 05 - 06 April at Walwa near the NSW border. The CEI 2 * 80km event was run on Saturday with the main event, the CEI 3* 160km event, run on Sunday. Both events were small in number but the competition was strong, particularly in the 3* event. This was one of the qualifying rides for the World Championships for Endurance, which are to be held in Malaysia in November 2008. The qualification criteria for this event has been strengthened ahead of concerns about the ride being run in a tropical climate. Rider and horse combinations must successfully complete 2 x 160km events in a time of less than 13 hours and 20 minutes in the 24 months preceding the World Championships with one of those completions in the twelve month period prior to the event. EI has affected, as it has for all horse sports, the preparations of combinations who are wanting to be considered for selection for the World Championships. Mudgee Endurance Riders will be holding their annual endurance ride at Cooyal on May 17 and 18. The venue at Cooyal Hall has proved very popular over the last five years and pre-nominations are being well received. The team of volunteers consisting of the Cooyal Progress Association, Cooks Gap and Cooyal Bushfire Brigade ensures that everything runs smoothly in the canteen and at the three checkpoints out on the track. The course is the same as last year and is very suitable for novice horses with no heavy climbs. The main 80 kilometre ride will commence at 6am from the Cooyal Hall and riders will then travel along Cooyal Lane, private property and Ironbarks Lane Kains Flat, then White Cedars Road and up the fire trail to Botobolar. They then return to base through Kains Flat and back through paddocks. The second leg takes the same course to Kains Flat, then does a loop up Kains Flat Road and private property to Botobolar Road, returning along Kains Flat to the third checkpoint and again through the paddocks back to base. Motorists are advised that many horses will be out on local roads on Sunday May 18, between 6am and 4pm. Local riders who plan to enter the 40 kilometre training ride are reminded that entry forms are available at Husbands Saddlery. Time is running out so don’t leave nominating to the last minute. For further information phone Pat Dickinson. At recent endurance rides, local competitors who were successful at Tooraweenah in pair were Bernice King, Hayden Fisher and Paddy Smith who finished first heavyweight and fittest horse in the division. At Bendemeer on May 4, Bernice King, Kate Pilley and Hayden Fisher were all successful. At Oberon in April, Mette Sutton was equal first across the line. The club would like to thank John Prince, Phillip Kenn and Roy Tuck-Lee for allowing access through their properties. The club has also received generous sponsorship and would like to thank Mid-Western Regional Council, Macquarie Valley Juices, Mudgee Vet Hospital, Tony Reeves, Glenyce Cook and Husband’s Saddlery. The weather was clear and warm during the days, with cooler nights. The track was quite hard underfoot, and 'competitive' horses had been warned to be padded in advance. I chose not to pad any of mine, as we have not had any rain to speak of, and our training tracks are very hard anyway... so my horses were primed! The facilities at this ride base are adequate, but there were a few hassels with the bigger rigs driving around the arena and getting stuck on the 'mound' halfway, due to the normal access being blocked off to traffic. The presence of the Malaysian King and his entourage meant that the security blokes were very visible all weekend, and the limo drivers seemed to be pretty impressed and interested in the goings-on of the ride. A large contingent of other Malaysian and UAE riders also made for a real international flavour to the ride. Gilly Wheeler was also in attendance, so doubtless there will be a write-up in the next edition of Endurance World Online. There were actually five different rides on during the day on Sunday, with an FEI*** 160km, an AERA 160km, an FEI** 80km, an AERA 80km, and an AERA 40km training ride.... meaning that the secretarial staff had a huge job to do. The volunteers came out of the woodwork to assist with the ride, and the FEI officials were also drawn from around the country. President of the Ground Jury was the awesome Barb Timms, and she kept everyone on their toes across the weekend. I'd like to thank all the Veterinarians, the FEI Officials, the SES, the Ride Volunteers and the Ride Organisers for their efforts to make this ride the success that it was. And the Splendacrest Team did have a very successful weekend!! I am thrilled with our results, and very proud to present such a cohesive team of riders and some very good horses! In the FEI*** 160km ride, young Tarnia Kittel achieved 2nd placing in the Youth Division, and also then took out the Best Conditioned Horse award on Raaward Chanelle (owned by Zoe Gardner). Chanelle looked picture perfect the next morning at the BC workout, and certainly turned a few heads! Gerard Bou completed his first ever 160km ride, riding Splendacrest Fiesta (owned by Shigeru Ogawa of Japan) to 14th Open placing in the FEI*** ride. We call this little mare 'the Machine', as she just never stops! G was a bit tired after it was all over, but extremely happy with his result... as he should be! In the AERA 160km ride, young Ingrid Ambrosiussen rode one of Kate Gadsby's horses, Kazzy, to 2nd Junior placing.... for that horses' first 160km completion and Ingrid's second successful 160km ride. In the FEI** 80km ride, Lisa Stoffel was mounted on Manana Gaylord, and also achieved 2nd Youth placing! (So that's three 2nd placings for these 3 young ladies over the weekend!) Thanks to Yvonne Knight for giving Lisa this ride! In the AERA 80km ride, Angela Head had the responsibility for escorting our Japanese guest, Takeshi Ito, around. Angela (on Shaah) and Takeshi took out =9th Middleweight placing, with Takeshi being extremely happy to be once again riding his favourite horse, Splendacrest Perfection (owned by Shane Hopkins). Jess Hewitt also completed the 80km ride, on Bacchante Silver Lace (also owned by Shane Hopkins), in 13th Middleweight position, bringing her into the Open Endurance Rider ranks with her third 80km completion! Congratulations Jess! Amanda Powell completed the 40km ride on Summit Park Raz, and our thanks go to Lisa Stone for this ride! I'd like to thank my crewing team of Sam Dobson, Britt Geddes, Jan Kittel, Viv Ambrosiussen, Shane Hopkins, Albie Knight, Yuko Crease, and Tanya and Roman Stoffel.... without you the weekend would not have been as successful or as fun! One of the most amazing things I have ever seen in endurance occurred at the finish line of the FEI*** 160km ride. Brothers Matthew and Brook Sample WALKED over the finish line together, forcing a dead heat for 1st placing, and then Penny Toft and Meg Wade also WALKED over the finish line with their horses literally nose-to-nose forcing a dead heat for 3rd placing! The reaction from the crowd to this display of sportsmanship between these two highly competitive ladies was pretty wild! Tanku Mizan (the Malaysian King) crossed the finish line for his 2nd successful WEC qualifying ride on the lovely appaloosa cross 'Pharaoh' and was surrounded by wellwishers, press, spectators, etc for some minutes, forcing his 'minders' into a mild panic! All in all, a very good ride, and a great start to the season for us! MELBOURNE: Yang di-Pertuan Agong Tuanku Mizan Zainal Abidin qualified for next year's world endurance championship to be held in Terengganu when he completed the gruelling Nanango three-Star 160km International Endurance ride near Kingaroy in Queensland, yesterday. The King, 45, was one of five Malaysians to join an international field of about 50 riders from New Zealand, Japan, Poland, Britain, the United Arab Emirates and Australia in the ride. They started their ride at 5am. Tuanku Mizan completed the course in under 13 hours 20 minutes to qualify for the world event which requires a rider to finish the 160km ride twice on the same horse. The King, who was astride Pharoh, rode the same horse in Queensland last year in the first leg. Tuanku Mizan had already qualified for the world championships when he rode Ibrahim in Dubai in January and again in Abu Dhabi in February within the qualifying time. This has given the King the choice to decide which horse, Ibrahim or Pharoh, to ride in Terengganu in the November world meet. Royal Terengganu Endurance Stables general manager Che Mat Din said the 160km ride was tough and tested the competitors' strength, determination and riding skills. GHAZI Al Dossary steered Jelham to victory in the 100-km Endurance Horseride Championship, organised by the Bahrain Royal Equestrian and Endurance Federation (Breef). The final event of the endurance season, sponsored by Zain-Bahrain and co-sponsored by GPIC, started on Thursday evening and concluded early yesterday at the Bahrain International Endurance Village in Sakhir. A total of 71 riders from Bahrain and Saudi Arabia lined up for the event which featured four stages, 30 kms each for the first three and 10 for the last stage. The Royal Endurance Team dominated the race taking the first two positions with Al Dossary, coached by Shaikh Daij bin Salman Al Khalifa, coming on top with a total time of four hours, 15 minutes and 35 seconds. Behind him in second place was teammate Nezar Hassan (4:26:44). Just five seconds behind in third was Ahmed Al Fateh Stable rider Ibrahim Al Jeboori. Royal Endurance Team riders Ahmed Abdulla and Raed Mahmood were fourth and fifth respectively. Baqer Ali of Abdulaziz Yousef was sixth and he was followed by Jaffer Mirza and Abdulrahman Al Saad, both of the Royal Team. Ninth overall was Mohammed Rasheed Al Malhasi of Saudi Arabia's Kingdom Stable while Mohammed Riyadh of Al Hafira Stable wrapped up the top 10. The championship got underway with Mahmood leading the first stage with the fastest time of 1:10:42, average speed 25.46-km per hour. Mahmood maintained his lead in the second stage and was followed by Hassan and Manal Fakrawi. Al Jeboori made a strong comeback in the third stage, moving on top and ahead of Mahmood who went down to third with Hassan making a good leap to second position. The fourth and final stage was the most exciting in the competition as Al Dossary regained his momentum to take over the lead from Hassan and Al Jeboori. Among other top riders who took part was Bahrain Athletics Association president Shaikh Talal bin Mohammed Al Khalifa who was forced to quit following an injury to his horse. Shaikh Talal was also on hand to present the trophies to the top three riders at the prize-giving ceremony which was held right after the race. Meanwhile, Breef president Shaikh Nasser bin Hamad Al Khalifa and Breef first vice-president Shaikh Khalid bin Hamad Al Khalifa congratulated the winners and wished them success in the near future.